Thanks for this very helpful writeup. Appreciate the work you have done in terms of contacting SCB. Just wondering what do you mean when you wrote canada does not have a all in one etf? Hi, if i am correct most of these countries have an ETF that lets investors invest in a cap weighted basket of global stocks. Canada doesn’t seem to have such so you would have to get 2-3 ETF to form that basket. i see. thanks for the reply, Kyith. Can you please help elaborate more the tax from US exchange or refer me to your earlier post in case I miss it? Thanks. In majority of the countries there are tax issues or costs inconvenience that we have to contend with. In the US context, all dividends are subjected to 30% withholding tax. This depends on where the corporation is domiciled. If it’s listed in us but is a UK firm there is no withholding tax currently. All us firms or firms listed in us if you invest in them, regardless where you are from are subjected to estate duty, this means that any asset amount above 60k use are tax 50%.so if your portfolio grew to 1 mil, your 940k gets halved. As with all things, do check with your tax advisor. Thanks Kyith. Didn’t know about the estate duty previously. It surely makes it more tricky to find low cost, diversified ETFs from this part of the world. the 50% tax you’re referring to her is inheritance tax, isn’t it? Or when does this 60k limit actually come into play? Thanks for sharing. I’m also using StanChar online trading platformp; however, i found the exchange fee + processing fee is rather bad with the bank account. Do you have any means to exchange SGD to GBP in low cost? or do you find the exchange is quite ok? Thanks. Thanks very much for sharing. I have been investing in Vanguard ETFs listed on NYSE through ToS. I supposed I will be subject to the 55% estate duty when the time comes? If so, what is your advice if I want to continue investing in Vanguard ETFs? through Saxo? Hi WJ i cannot advise on tax matters. There are folks who told me if your assets are in non US nominee account they might not be able to trace it. It is a risk that you have to evaluate if you are willing to take. Hi Kyith, more people are starting to use Interactive Brokers for their spot exchange rate. Do you know if IB also charges the stamp duty for UK shares? Hi Mark i do not have that piece of information unfortunately. Hi Drizzt, I have got the reply from SCB. They confirmed that on their side, ETFs on LSE with ISIN starting with GB and IE are exempted from stamp duty. The fees shown when placing order is only indicative. To look at the actual cost, you have to look at the contract note. Bolded words are the exact words the person on the phone used. that is what i am told, but damn they didnt say it will be different from the interface! BTW, Drizzt, promote VWRD (USD) instead of VWRL (GBP) due to the more favourable exchange rate. You cannot view VWRD in stock quote but you can place order. Awaiting your updates. Btw my VWRD holdings are still in Saxo. As Saxo introduced the inactivity fee, SCB is an option to transfer my holdings to. Hi Kyith, just asking how do you get to buy VWRD in SCB as I cannot find it in the quote? Hi momo, what do you mean by more favourable exchange rate? Is it on Vanguard’s side or our side? It is on SCB’s foreign exchange rate. You can view it after logging into SCB online banking (Rates -> Foreign Exchange Rates). To buy VWRD, you have to transfer from your SGD account to the USD settlement account. For VWRL, it is GBP. Furthermore, dividends from VWRD/VWRL is in USD. Hope this clarifies. isnt the VWRD less favourable as it incurs a 30% dividend witholding tax, as per all US stocks? pardon my ignorance, so does it mean that VWRD is exempted from the 30% witholding tax even though its trading in the US markets? as an example, suppose Telefonica ADR is traded in NYSE in US. which withholding tax structure it follows. since telefonica is from Spain, its withholding tax is 19% instead of the US 30%. another example Vodafone ADR is traded in NYSE in US. it is a UK company so its withholding tax is 0% instead of 30%. Hi drizzt. I’m not an expert but I think you got 1 statement wrong. This is my understanding: Vwrd is domiciled in Ireland. It is trading on LSE. There is no stamp duty because it is domiciled in ireland. From 1 april 2014, Etfs domiciled in uk also have no stamp duty. There is no dividend withholding tax because it is a UK stock. However there is inheritance tax above GBP 325k because it is a UK stock. Hi Kyith and Momo, have you considered Interactive Brokers for ETF purchases on LSE? Comparing to Standard Chartered, we can save on Exchange Rate (IB uses Spot Rate) but there is a minimum fee of $10 per month. Hi Kyith, could the reason be that the ETF already paid the tax at 15% rate before distributing dividends? hence you do not see the witholding tax. Hi wj, I didn’t consider interactive brokers since I am trying to consolidate most into one broker. It would seem all brokers have inactive trading fee. 10 doesn’t look a lot. What shiny things could be the case. The pairing of withholding tax between USA and Ireland comes into a picture and since there is no withholding tax between UK and over here we get the reduced rates. Thanks for your reply, Kyith. So is it true that we will be taxed 15% (not 0%) dividend witholding tax for ETFs listed on LSE, e.g. VWRD? i believe the tax is implicit, meaning you wont see it. this is already deducted from the dividend. i have not received my frist dividend so cannot verify this. I received it but seriously, I have no idea how much was originally declared ! hi momo, i haven’t received the recipt (hardcopy) but the executed price was 68.15, the withdrawal amount on my online account showed 68.33. Thanks kyith. What’s the difference of 0.18cents though? What is the gst on? 7% of the commission? Thanks. Time to update your blog post 🙂 Do warn users of the poor exchange rate though. Let $10,000 be the amount of new monies invested in a year. Let SCB’s commission be 0.25%, FX fees be 0.85%, for a total cost of 1.1% (lets exclude GST). Let SCB’s commission be S$16 (8 GBP), FX fees is 0.5%. Let there be a trade each quarter to avoid inactivity fee. As you can see, there is no winner as it depends on your own unique circumstances (investment amount, frequency). Hi Momo, should SAXO’s commission be 20GBP instead of 8GBP? If I am not wrong, SAXO is charging 0.15% or minimum 20GBP per trade. So if you trade every quarter, the commission will be 80GBP? Hi wj. You are right, I just logged in to check. They have increased the commission from 8 GBP to 20 GBP! wow WJ and Momo, why would Saxo take such a step? Hi momo, where can I find a full list of Vanguard’s ETFs listed on London Stock Exchange? I checked https://www.vanguard.co.uk/uk/portal/investments/etf and cannot see VWRD. Not sure if there is any other Vanguard’s ETF available on LSE but not in the website list. Hi wj. I don’t know if there is a better way. One way is to open up each of the factsheets to see the symbol for the different trading currencies (if any). For the case of VWRD, see VWRL’s factsheet. Once again, VWRL and VWRD are the same fund (Vanguard FTSE All-World UCITS ET), just different trading currency (look at VWRL’s factsheet). Hope that helps. may i ask why are you all not considering dbs vickers if you have only 1 type of counter for usd? the exchange rate is better than SCB and the custody fees is 24SGD per year. i calculated for every 10k sgd invested. the difference for SCB is 23.8SGD, this is comparable to the custodian fees alr. how did you get the $110? but i can give you my calculations for usd. DBSV has a min transaction of 30USD/0.30%(wrong info previously), I included the SGD24 custodian fees. SCB is .25% (lets ignore gst). I choose 13k SGD because with 13SGD the min amount would be ard 31USD. I believe we must see how much we want to invest each time before deciding which broker to use. hi prudent, perhaps DBS Vickers is better. in that case we should use that. but is the rates going to stay the same for SCB. that is an issue, and i am not going to say I recommended it but its rather convenient to have the flexbility to invest in any amount we can. 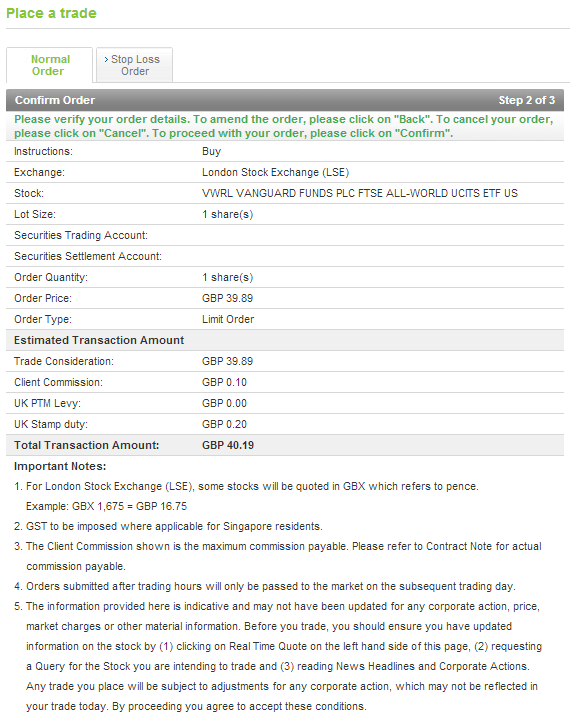 there is no doubt for LSE, SCB is better as DBSV min charge is 50GBP. In any case, i believe the FX for both banks will move in tandem. the % difference should not differ so much. I still haven decide how much i global exposure i want to have. I am still banking on nikko am STI currently. Looking at LSE or NYSE vanguard products. but the xrates and fees are keeping me at bay. perhaps you can think about Canada as well with Vickers. Pardon me for digging out old posts. It appears that the stamp duties are still in effect for the two respective etf, VWRL and VWRD. How is your trial out so far? Also, I am curious in this area. Do you happens to know if there are any tax on capital gain on both the thrust and us as an individual ? As I understand, such ETF’s are tax efficient in US. I’m not sure if it is so in UK. If there is a reversal to this that you experienced, do feel free to correct me. As for tax efficiency, i am not sure if you are refering to the structure of the ETF. What i understand is that non-syntehtic ETFs are traded and market made by the AP, so they bear most of the commission charges, which is usually where the tax is levied, leaving the ETF Fund itself not having to incur these costs. I believe they are the same for UK Vanguard funds as well. Perhaps you can do a google on it. Indeed I have not read the following post. Well that just explains it. I saw the stamp duties at the screen which I had made the transaction. But I have not yet receive the hard copy to notice it was not levied. This is a breakthrough! The death tax has always been my mental barrier to invest in US index. Now It gives me a better reason to do so. I see on your clarification on the structure of the etf. Most probably I had misunderstood it as I was thinking they might be tax on capital gains like the active mutual funds. I will read up more about this matter. im glad i can help you there. VWRD and VWRL are the same ETF, just different trading currency. VWRD and VWRL are the same fund, just different trading currency. See http://www.vanguard.co.uk for more info. Hope this clarifies. Hi Nate, yes thats right. USD has the most favourable exchange rate for SCB. You can view the rates for yourself if you have SCB Online Banking (Rates -> Foreign Exchange Rates). Note however that SCB’s rate are still absymmal. Saxo is still cheaper for me assuming a quarterly investment. Hi Drizzt, let me spin off another thought that I had some time back but did not investigate further. Is there any estate/inheritance tax or any other tax (capital gains tax?) if we Singaporeans buy Ireland-domiciled ETFs on the Swiss Exchange? Because if there is none, then another option is to get accumulating ETFs (no dividends) from the Swiss Exchange, for e.g. some iShares ETFs. nah there isnt. i havent gotten the statements yet. we got to wait a while. 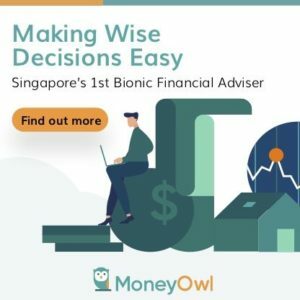 Hi Drizzt, thanks for starting this discussion online – you and I have discussed the big difficulties a Singaporean/SG-based investor faces in trying to build a low-cost, tax-efficient, diversified portfolio. not providing tax advice here, but its important to keep in mind that witholding taxes can be reduced by taking advantage of DTAs (Double-Tax Avoidance Agreements). Singapore and US do not have a DTA, so a Singaporean/SG-based investor buying directly into US-listed ETF will be hit with 30% WHT on dividends, but if we were to buy a UK-listed/Irish-domiciled ETF (like VWRD) that holds US stocks, the withholding tax deducted by the US is only 15% due to the US-Ireland DTA. Furthermore, there is a UK-Singapore DTA, so those dividends from the UK-listed ETF do not incur any withholding taxes if they are sent to us in Singapore. I believe Canadian ETFs may provide similar benefits, but need to investigate further! seems Canada and swiss are viable places. Hi Kyith, you’re welcome. I think this is how it works – to the US, the investor holding US securities is from Ireland, hence only 15% WHT is levied. To the Irish, the investor is from UK (so I presume no WHT). To the Brits, the investor is us in SG, hence no WHT. I suppose VWRL is “holdings in authorised unit trusts and open-ended investment companies (OEICs)” and therefore, for non-uk-domiciled person, not taxable under UK inheritance tax?